Caroline Wozniacki and Jelena Ostapenko ended their losing streaks in stifling heat on day two of the US Open and Angelique Kerber also made it into the second round. Wozniacki and Ostapenko had not won since Wimbledon, but the grand slam champions advanced at the expense of Sam Stosur and Andrea Petkovic as temperatures soared at Flushing Meadows. Kerber, aiming for back-to-back major titles following her triumph on the grass at the All England Club was a 7-6 (7-5) 6-3 winner over Margarita Gasparyan on a day which saw the heat rule implemented for both men and women. Petra Kvitova was another major winner who advanced in New York at the expense of Yanina Wickmayer, but a struggling CoCo Vandeweghe – a semi-finalist in her homeland last year – was beaten by the unseeded Kirsten Flipkens. Sixth seed Caroline Garcia brushed aside Johanna Konta in straight sets, and Naomi Osaka, the in-form Kiki Bertens and Daria Kasatkina were among the other seeds to go through in the afternoon session on Tuesday, while 2006 champion Maria Sharapova prevailed. Wozniacki suffered back-to-back defeats following her second-round exit at Wimbledon, but looked more like an Australian Open champion as she saw the back of Sam Stosur with a 6-3 6-2 victory. The Dane, hampered by injury problems in the hard-court season, broke five times and made just 12 unforced errors against the 2011 champion. "I'm feeling pretty good. I didn't have the ideal lead-up to the tournament, but body-wise, I'm feeling great right now. It was a good test today, obviously, with the heat and then playing Sam." said the world number two. "I'm pleased with how I'm feeling. I'm just hoping that step by step, I can play better and better as the tournament progresses." Kerber will come up against Johanna Larsson in the second round after accounting for Russian Gasparyan. The fourth seed overcame a shaky start, losing the first two games of the match before coming from 4-2 down in a tie-break to take the opener, then raising her game to win in straight sets. Kvitova, beaten in the first round at Wimbledon, was too good for Wickmayer 6-1 6-4, breaking four times on Court 17 and hitting 28 winners in a solid display. The fifth seed was struggling with a shoulder injury before the tournament and said: "We'll see how my body will handle everything. 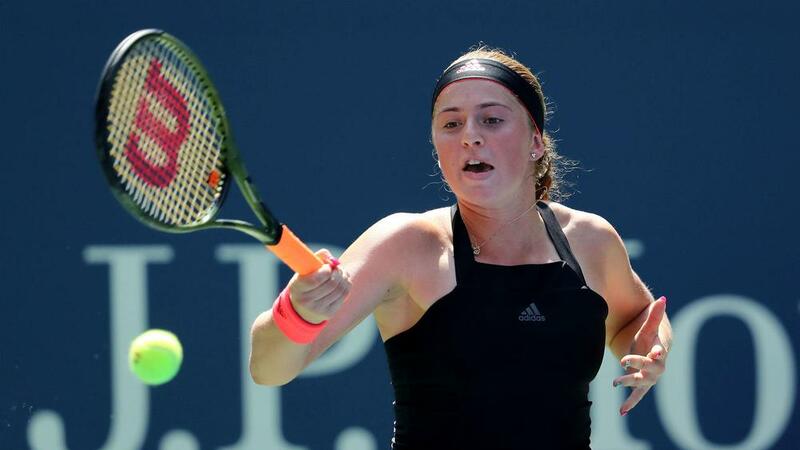 Hopefully I will not fall apart "
Ostapenko came through a battle with Petkovic, winning 6-4 4-6 7-5 in the first match on Louis Armstrong Stadium. The 2017 French Open champion lost both matches after a semi-final defeat to Angelique Kerber at Wimbledon, but drew on her battling qualities to reach round two despite making 60 unforced errors. The 24th seed struggled with her serve and made 35 unforced errors to fall at the first hurdle after falling to Madison Keys last year.